Using a laboratory model involving fruit flies, genetic researchers at the University of Miami Miller School of Medicine have identified a metabolic problem that may be responsible for Snyder-Robinson syndrome (SRS), an ultra-rare disorder that affects only boys. Zhai added that the SRS study shows the power of a combined approach using Drosophila (fruit fly) models in the laboratory and human patient cells for cross-validation and immediate translation. “This combined approach could provide ways to expedite the discovery of potential treatment strategies for rare neurological diseases, which are difficult to study in traditional clinical trials,” said Zhai, who is the senior author of the study published November 2 in the journal Nature Communications. Chong Li, a graduate student in Zhai’s laboratory, was first author of the SRS study, “Spermine Synthase Deficiency Causes Lysosomal Dysfunction and Oxidative Stress in Models of Snyder-Robinson Syndrome.” Miller School co-authors were graduate students Jennifer M. Brazill and Yi Zhu, and research associates Christofer Bello and Zoraida Diaz-Perez. The international collaborative study involved the National Institutes of Health Undiagnosed Diseases Program (NIH-UDP), Yantai University in China, and Greenwood Genetic Center in South Carolina. SRS is an X-linked genetic disorder characterized by intellectual disability and developmental delays that affect speech, mobility, and cognition. Many boys with SRS are thin and have low muscle mass and skeletal problems, particularly osteoporosis. Neurological problems are common, including seizures that begin in childhood. SRS may also present additional health challenges, such as kidney or respiratory issues. Zhai’s research team found that SRS is caused by mutations in spermine synthase (SMS), a polyamine enzyme that is essential for life. With SRS, the mutations generate toxic metabolites, including aldehydes and reactive oxygen species, which subsequently impairs the autophagy-lysosome pathway and puts oxidative stress on cells and causes other metabolic problems. “The oxidative stress caused by loss of SMS is suppressed by genetically or pharmacologically enhanced antioxidant activity,” Li said. Zhai has been studying rare neurological disorders for nearly a decade, with current support from the NIH, which collects patient DNA and provides genetic data to researchers. “In about 50 percent of these disorders, the NIH-UDP has identified a potential mutation in the genome, but can’t determine if it is causing the disease or not,” she said. 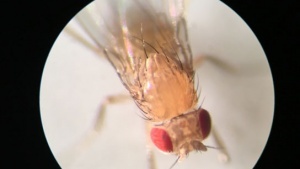 In 2013, Zhai received a grant from NIH-UDP for a pilot project using fruit flies to screen these mutant genes identified in UDP to learn which variations might be harmful to cellular functions. Next, they modeled those mutations and compared the outcomes with cells from patient skin samples.